A wonderful and exciting hiking trail along the seaside. Especially nice in spring. The limestone pine forest and coastal cliffs provide a habitat for many different plant and animal species. The trail starts at Kalasma campfire site and is marked with yellow ribbons. Viidumäe Nature Reserve is located in the western part of Saaremaa, in the vicinity of the ancient Antsülusjärve escarpment. This is the oldest and highest part of the Saaremaa island, with its top height 59 metres over the sea level. On the escarpment a number of biotopes characteristic of western Saaremaa can be found. 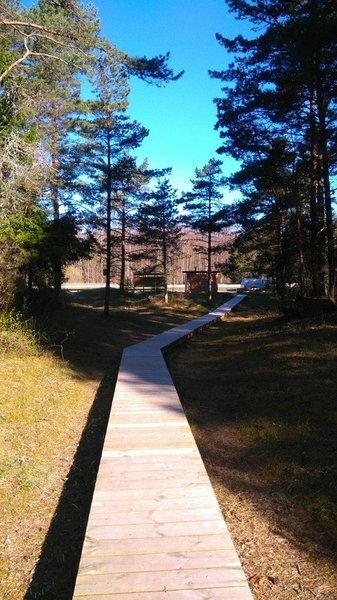 The hiking trail starts and ends at the parking area near the office of Viidumäe Nature Reserve. The campsite is located on the southern coast of Kööbe bay. On both sides of the campsite there are Silurian cliffs and ivy on them. A beautiful view on Vilsandi National Park aquatorium and the most western islet of Estonia. A good point for watching seals, birds and butterflys. Harilaiu peninsula is a part of Vilsandi National Park on the north-western coast of Saaremaa. The rectangular peninsula is connected with Tagamõisa peninsula by a narrow strip of land called Harilaiu Neck. There are beautiful sand and pebble beaches and dunes on Harilaid. The sea is continually reshaping the coastline. If you visit the place repeatedly, you will see the coastline changes with your own eyes. There are several freshwater lakes in the peninsula, the largest of which is Laialepa bay. In addition to its interesting landscape, Harilaid is an area of great botanical and zoological value. It has been a protected area since 1924 already. Harilaid has always been uninhabited and when you go there it feels as if you have reached the end of the world, somewhere far away from civilization, and you are at the mercy of natural forces. To go to the campsite at Laialepa bay, you have to walk about 4 km along a hiking trail. At the other side of the campsite is the open sea. A stopping point for discovering the most north-west peninsula of Saaremaa. At the Harilaiu peninsula you can view rapid natural processes where the sea is in constant battle with the land. One of the best exposed and accessible meteorite craters in the world. About 3470 - 3545 years ago, a huge rock from space came hurtling toward the Earth. Several kilometers above the Earth’s surface, the meteorite broke into pieces from the pressure and heat of the atmosphere. The explosion left nine total craters, now known as the Kaali Meteorite Crater Field. The largest crater (which measures 110 meters across) is believed to have been a sacred site for many centuries due to its cosmic origin. A campsite under the pine trees by the sea at tip of the Kuusnõmme peninsula. There is a parking area by the campsite. Kalja study trail introduces karst forms and their causes. Waters that go underground in Kalja sinkholes run as a subterranean river and appear on the ground again near Jauni village, Hiieniidi (Iilasmaa) spring area, to the north of Kalja sinkholes. The shaded campsite is in a former gravel quarry, which now looks natural. Located at Abula hiking trail. The trail runs in the largest bog of Saaremaa, where different development stages of the mire can be observed. A popular legend goes that in the bog lake of Koigi a treasure was once buried, and it is guarded by spirits who occasionally reveal themselves to people. The campsite is located in a former gravel quarry which offers a good place for camping, safe from winds. This is an excellent example of mine reclamation. The hiking trail introduces forest management, cultivated pine forests, protected forests and old indigenous trees. Campsite is located in the south-west part of Vilsandi Island. It has a beautiful view to the open sea and is a known swimming place with beautiful white sand among the islanders. The oak belonging to the oldest generation of the Loode oak stand, dedicated to the linguist Johannes Aavik, was measured to be 450-500 years old in October 2000. The oldest generation of the oak stand is presumably formed of trees that remained from the shipbuilding campaign initiated by Peter I. A place by the sea good for bird and nature observations. To get to the observation tower you must hike through Loode oak-wood. From the tower you get a beautiful view of Kuressaare Bay. A nice seaside spot surrounded by forest to stay with family or friends, or spend the night for free. Principles of freedom to roam must be observed! The former Karujärve military area has been transformed into a sports and leisure area. Visitors can camp and hike here in summer, and ski, sledge and enjoy other winter pleasures in winter. The former forest watch tower, nearly 30 m high, on Raunamägi hill in the highest part of Saaremaa. This is the earliest known forest keeper’s place in Saaremaa, dating from 1795, when Campenhausen prepared the first forest management plan for state forest and appointed Kiviste Andres as the forest keeper of Sopi forest. Around the hut there is old-growth forest with interesting erratic boulders, former anti-tank lines, old stone farm fence; the access road is built on brushwood. A seaside campsite near the Port of Triigi, where ferries travel to Hiiumaa. On the beautiful sandy beach on the Triigi peninsula. When the water level is low and the weather is warm, it is possible to go from Saaremaa to the island of Vilsandi on foot. Wading through the sea from one islet to another, you will first get to Väike-Vilsandi. At the rest stop you can take a break and, if needed, change your shoes. Coming from the sea, there is a coastal plain on one side of the rest stop and a pine stand on the other side. Between them a path leads towards Suure-Vilsandi. A good view of the sea, especially in the evening, when boats arrive at the harbour. The nearby sights of interest include the Harilaid peninsula with the tilted lighthouse of Kiipsaare, the interesting wooded meadow at Tagamõisa, Kihelkonna church, Mihkli Farm Museum, Viidumäe Nature Reserve and Loona manor, which houses the Visitor Centre of the Vilsandi National Park. The “backbone” of the Saaremaa Island is the highest and oldest part of the island which began to emerge about 10,000 years ago. The coastal escarpment has been preserved at the height of 18 m to the present day. Viidumäe Nature Reserve is home to over 660 species of vascular plants, among which 59 rare species are under protection in Estonia. The most famous of these is the endemic Rhinanthus osiliensis, a species of rattle. The escarpment is surrounded by a belt of springs, 70 to 80 according to the count. In some places crooked oak trees grow in the understory of pine forests. Bogs and fens cover about 10% of the nature reserve. The trail starts at Viidumäe Nature Reserve Centre in Viidu, 28 km from Kuressaare. The trail runs alongside the historic Sõrve postal route and offers a view on the coastal terrace with species-rich protected mire below it. 35 km along Kuressaare–Sõrve road. The information room and campfire site is located in the territory of Vikati port. In the information room you can find maps and brochure. The two hiking trails start in the middle of the island close to the biology stations observation tower. The Visitor Centre of Vilsandi National Park is located near the western coast of Saaremaa island, in an ancient Loona manor complex in Rootsiküla village. The centre provides information about the unique nature and the marine heritage in the islands and coastal areas. The nature as well as the centre are open all the year round and have something to offer in any season of the year. The permanent exhibition in the centre gives you good ideas of what more to discover in addition to the planned. The centre provides all possibilities for wheelchair users. Visitors can watch nature documentaries and read literature on nature, get information about recreation opportunities in the area, and boat trips to the Vilsandi island. The centre gives directions to hiking trails that introduce birds' life, rich vegetation and geological treasures of the national park. Also you will get information on Viidumäe nature reserve and other protected areas. Vilsandi Nature Park Visitor Centre organises pre-announced free nature events and nature education programmes for all interested.